Many of our readers share their porch decorating holiday ideas with us. They have shared their holiday porch pictures with us. We hope you enjoy them as Dave and I do. They are ordered according to the calendar year. 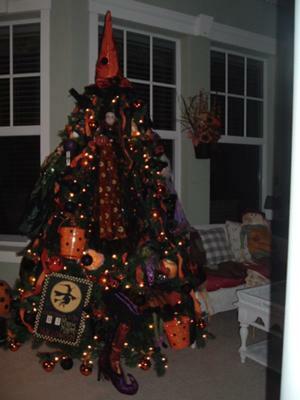 Rhonda: I love to decorate for each HOLIDAY. My husband and I have done this for 35 years, and now one of our sons does most of it. Here are our Valentine Decorations for this year. We love our front porch. We love to go "shopping" inside our house to find things that match the colors we are working with. 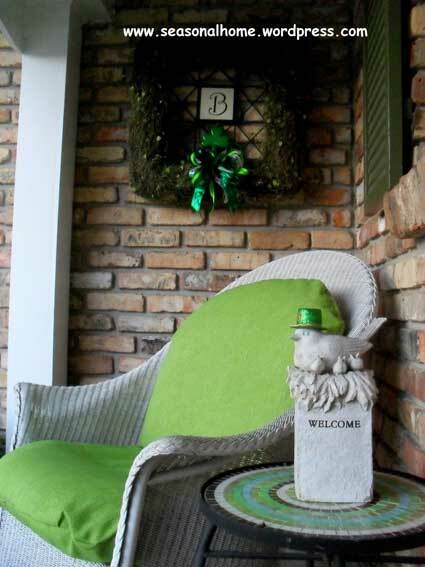 Mary and Dave: Rhonda, your front porch decorating ideas for the holidays are awesome. We remember your autumn decorations, too. 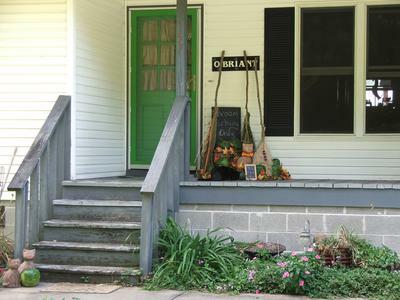 We like how you use what you already have to make your front porch so inviting. The reds and pinks for Valentine's Day are sweet. Are those heart-shaped pillows? Wow. You have the kind of porch most of us dream about. My goodness, I love all your porch rocking chairs, outdoor lamps, spinning wheel and lovely accessories. Thank you so much for being a part of Front-Porch-Ideas-and-More. How kind of your son to help you continue your tradition. 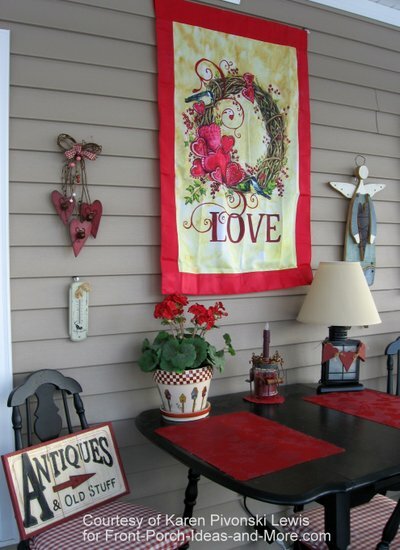 Have you seen Shirl's Valentine Decorations? Like you, she decorated for Valentine's Day also. 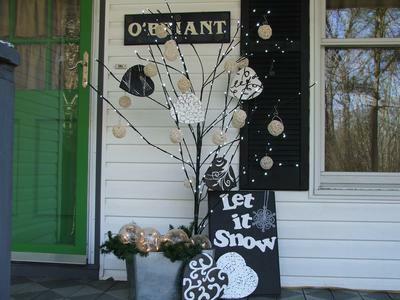 Beth: For January and February this year I decorated my porch with black and white painted hearts on an LED tree. The bucket of snowballs are old garden lights that I have taken apart and put twinkle lights inside them. 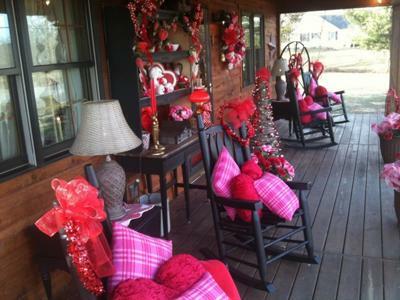 Get more Valentine decorating ideas for your porch here. 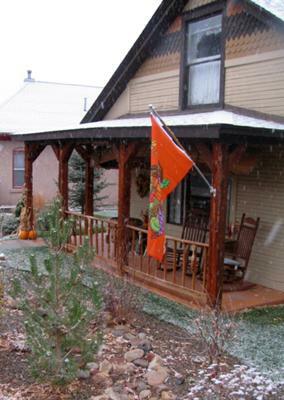 Mary and Dave: Thank you, Paul, for sharing your porch picture with us again. 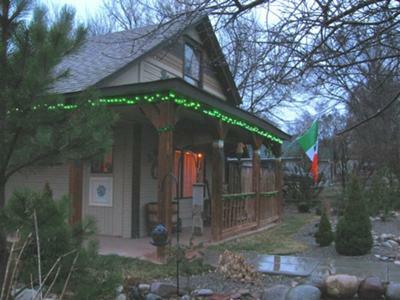 We love your green shamrock lights around your porch roof and the shamrock garland on your porch railings. 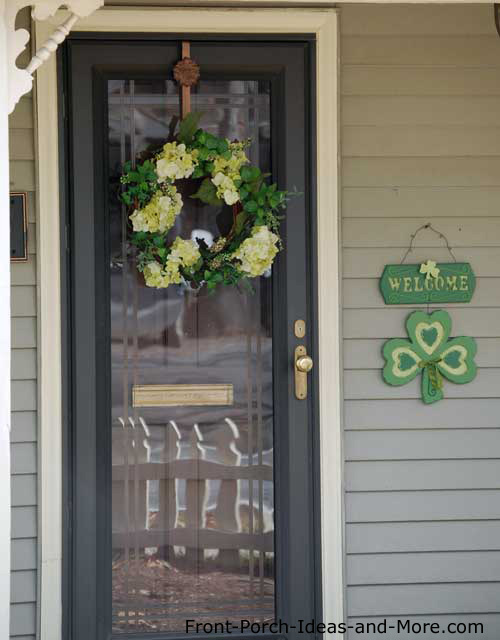 Add a sparkly green shamrock to your front door like Eileen from The Seasonal Home did here or just by adding a sparkly green bow to an evergreen wreath you already have like you see in Eileen's picture below! And see how she put out green cushions? Take note of the sparkly top hat she put in her but bird statue. Awesome, Eileen! - Put sand in green party bags and then add a tea light. Light the candles in the evening to illuminate your steps. Of course, be safe about it. 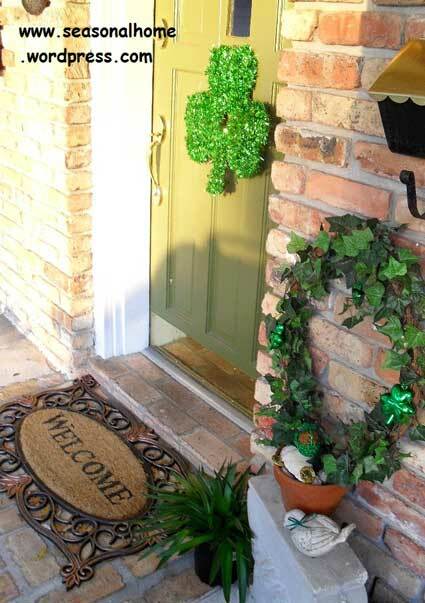 - Wrap your front door in green foil and hang a shamrock wreath on it - or even a leprechaun. 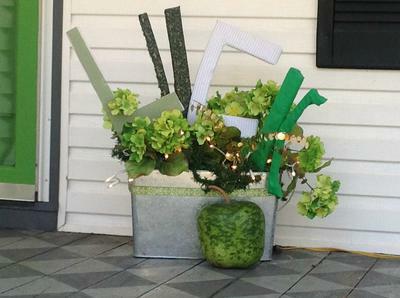 - Decorate your mailbox in green. We saw some creative mailbox covers here. 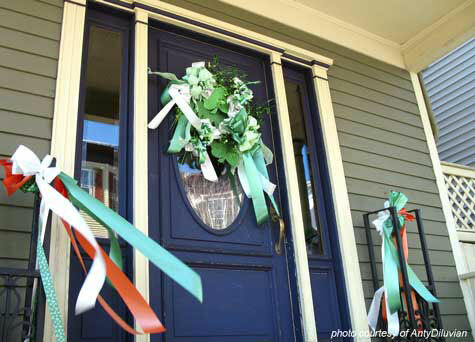 There are also St. Patrick's Day banners to hang from your porch. 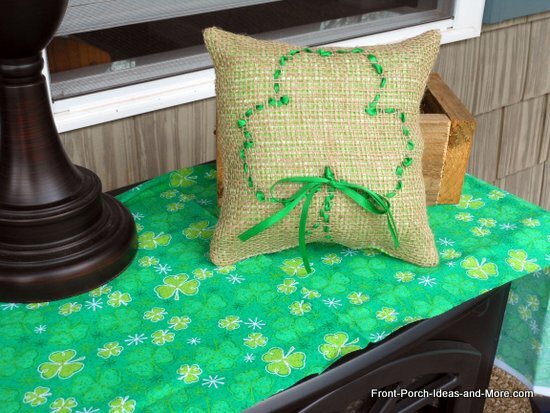 Make this adorable burlap shamrock pillow in time for St. Patrick's Day. 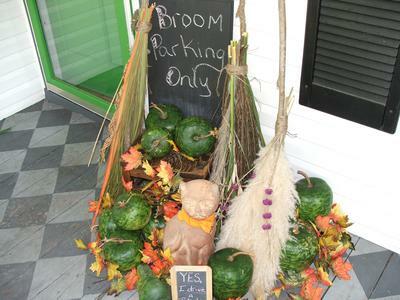 Dee: An earthy and whimsical farmers porch (plenty of mums, pumpkins, gourds, and all kinds of squashes). 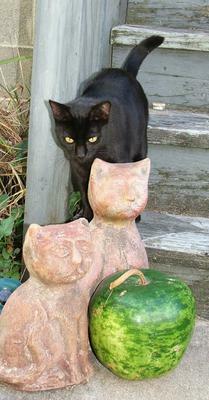 Hanging lanterns and big, black cat get us into the spirit of Halloween! Mary and Dave: I like your autumn porch. Looks so pretty and festive. The cat is really charming. Thank you for sharing your picture. 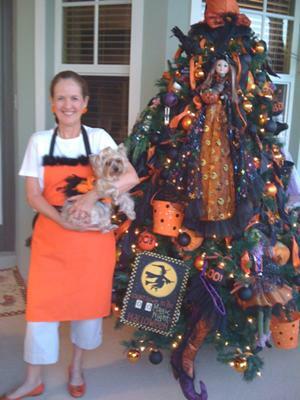 Miss Janice: The week after Labor Day I put up my tree and decorated it for Halloween. After that, the tree is decorated for Thanksgiving and then Christmas. My tree stays up for almost four months! 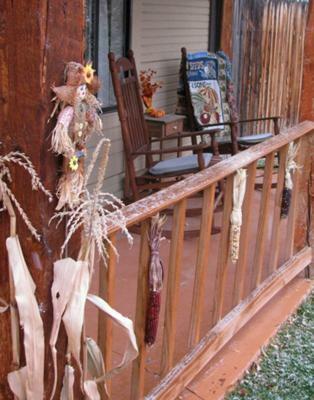 Mary and Dave: Miss Janice, we love the way you decorate your porch for the seasons. We'd love to see your tree decorated for Thanksgiving and Christmas, too. We bet you get lots of compliments from your neighbors and friends. Thank you so much for sharing this with us. 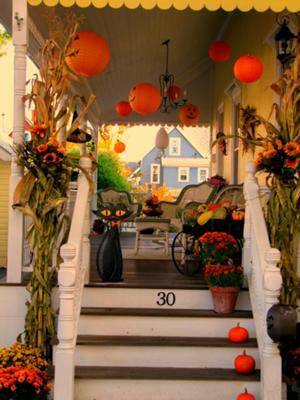 That's a really fun porch decorating idea! 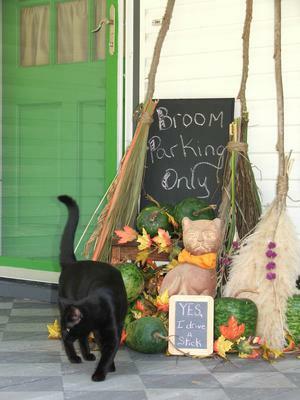 Beth: Porchscape for 2013 is three handmade witches' brooms with apple gourds and terra cotta cat. Brooms are made of natural things like cat tails, Scotch Broom, American Beauty Berries and Pampus Grass tied to a branch. Mary and Dave: Always a pleasure, Beth. Thank you for sharing your Halloween porch with us. You are very creative! Beth: Thanksgiving with a French Twist was my Thanksgiving theme this year. So I wanted the porch to feel a little Frenchy. I made the cork orbs, used green apple gourds. The Bon Jour sign is a framed placemat and then I wrote on the glass with a Calligraphy pen marker. Mary and Dave: Beth, thanks so much for sharing your Thanksgiving porch with us. We really like the French twist. Very innovative and fresh. Merci beaucoup! 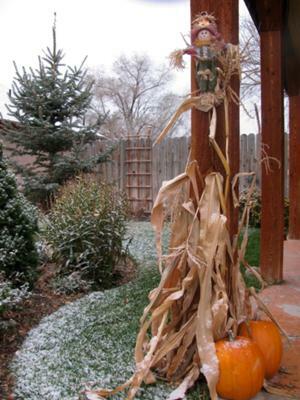 Paul: A little dusting of light snow on the Thanksgiving pumpkins out here in Colorado. Mary and Dave: Paul, we appreciate that you shared your Thanksgiving decorations with us. Your porch is one to envy. 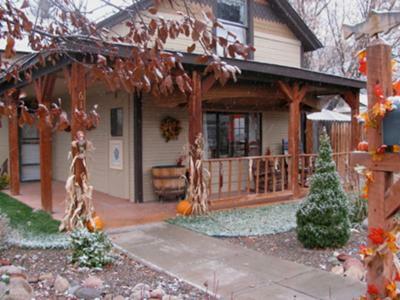 I like the snow brushed pumpkins, the straw man and your comfortable porch rocking chairs. Also, your autumn flag adds a big boost of color, too. Awesome, Paul! Thanksgiving is probably my most favorite holiday of the year. It's a time to just be grateful and share time with family and friends. Not to mention the turkey dinner and pumpkin pie. 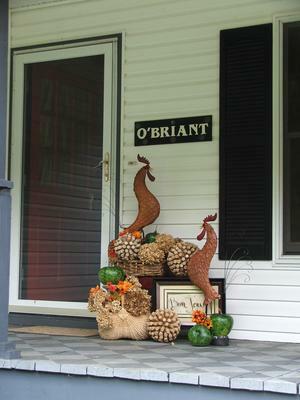 I like the fact that you can carry your autumn porch decorations right into Thanksgiving - and they look perfect. 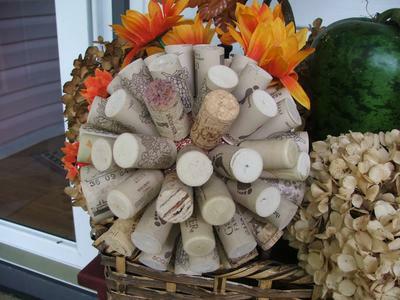 We have even more Front Porch Thanksgiving Decoration Ideas on our site for all to enjoy. 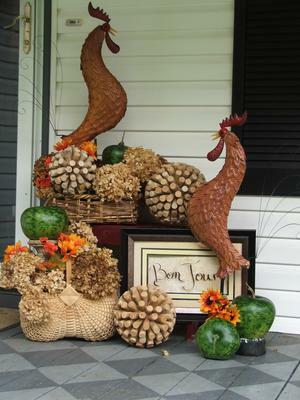 And here's even more Outdoor Thanksgiving Decoration Ideas. No matter the season, it's a time to enjoy your front porch, your family and your life. Thank you so much for your contribution, Paul. I bet that holiday feeling is in the air where you live. Very pretty porch indeed. 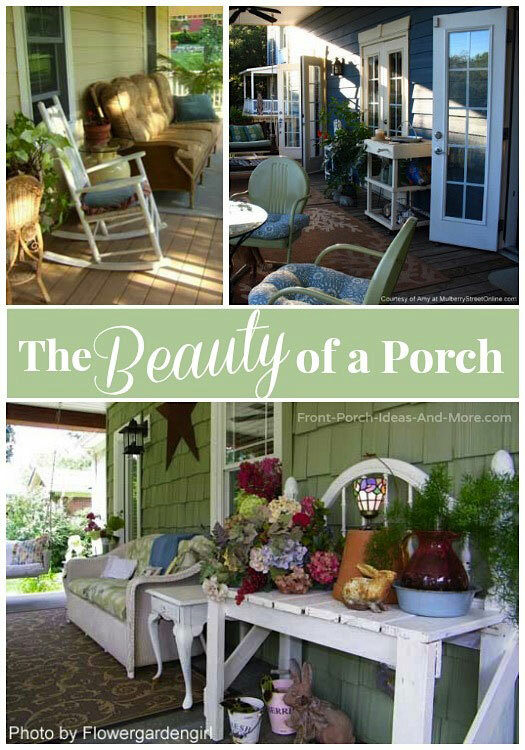 We have more pictures and porch stories shared by readers for you to enjoy.